The Roost is a game room opened to all enrolled students at The University of Texas at San Antonio. We are located on the second floor of the HEB UTSA Student Union across the center bridge or right above Frost Bank on the main campus. The Roost offers a variety of games such as pool, air hockey, foosball, ping pong and board games. The Roost also has six different gaming systems, Wii, XBOX 360, PlayStation 3, Playstation 4, Xbox One, and Wii U with over 50 different games to choose from. There are a variety of videos games for each system to choose from. A list of the video games for consoles can be found by visiting The Roost check-out office. So what are you waiting for? Come and stop on by! All you need is a valid UTSA student I.D. UTSA Student Union Programs hosts weekly tournaments in The Roost each week during the fall and spring semesters. Space is limited so get to The Roost early on the day of the tournament. Tournaments vary each week and include video games, ping pong, billiards, chess, and more. 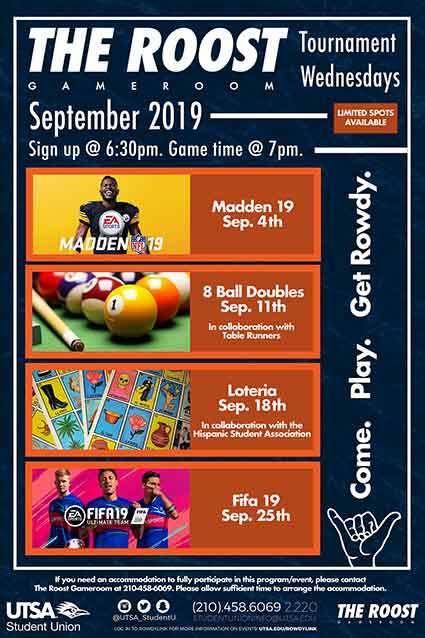 Visit the UTSA Student Union RowdyLink for a schedule of Roost tournaments. Respect one another: In order to provide a friendly environment, please respect one other. Refrain from the use of profanity: UTSA is a diverse community with different cultures. In order to provide a comfortable environment with respect for everyone, please do not use profanity. Be patient when waiting: It is our goal to provide the best experience at The Roost, however, there may be many times where you may be put on a waitlist. We will try our best to check out your designated equipment on time. Please ask before moving furniture: At The Roost, we strive for the best accommodation for all patrons. Report any problem you may encounter while at The Roost: If you encounter any problem or concerns please let staff in the office know and we will try our best to resolve any problems, issues, or concerns. Respect the equipment provided for your use: Remember, The Roost is for all UTSA Students, which means the equipment we check out is used by all students at UTSA. We ask everyone to take care of the equipment and report any problems or damage to the equipment. Have any ideas, suggestions, or comments? Don't forget to leave your suggestions, comments, or ideas in the suggestion/comment box located at the main entrance of The Roost. Just fill out a comment card and drop it into the box. The Roost is a program offered through the Student Union and is part of the University of Texas at San Antonio. Therefore, we ask students to use their best behavior at The Roost and to remember that their behavior and actions represent the University. Throughout the year, The Roost welcomes visitors from many places, including students under 18 touring the facility. We therefore ask UTSA students to be at their best behavior and respectful to others when using The Roost. During final exams in December and May the building will be open 24 hours.